Convertible Types: Prior to the change, your domain model could only have primitive types that were supported directly by the database. 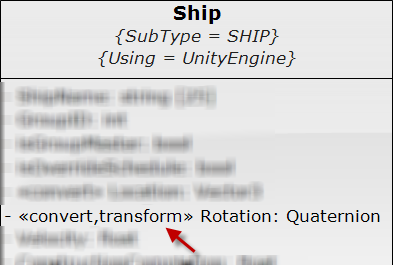 In the new version, whenever the attribute uses the stereotype "convert", we generate a converter. Your job is to convert the field into a string field so that it can be stored in the database, and provide a converter back from a string into the internal type. Important Note: During this change we did try to implement a MonoBehaviour interface so that database instances could be directly assigned to components on Game Objects. However, Unity does not support this ability. 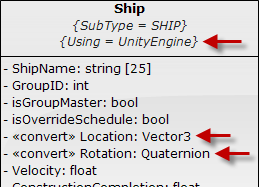 At best you can say gameObject.AddComponent<Ship>() ... but it returns it's own instance. Our framework create's it's own instance as well, and there isn't a way to tie the two together. We now use an attributes multiplicity for string fields to identify the string field length. This does not break existing code, but does allow for two different ways to specify strings. Changed the Master references to automatically unload the child from the original parent and assign it to the new parent's child list. The code shown below is the change. This allows code to simply reassign the parent to update all of the references properly.